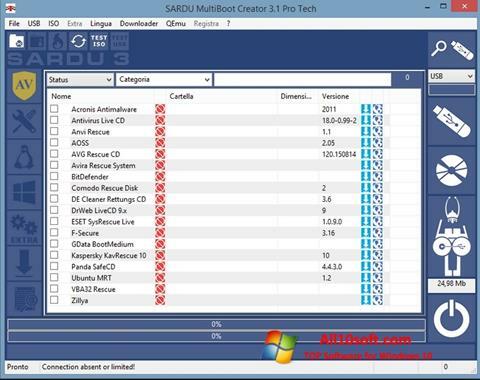 SARDU for Windows 10 - A comprehensive software solution designed to create bootable flash drives with diagnostic tools, treatment and recovery tools. Allows you to create your own build with the necessary set of utilities or antiviruses. It will be useful in case of failure or infection of the OS. Can be used to record operating system distributions. To master and use this software is not difficult thanks to a simple, intuitive interface. Without leaving the main window, you can download any software products and images, then create a bootable drive with a convenient menu. You can free download SARDU official latest version for Windows 10 in English.